There aren't very many people that own a business in their early 20s, let alone two. But, then again, most people aren't Nick Showman. I met Nick for the first time back in 2009 when he interned from me at Denison University. he was young and inexperienced but had a passion for developing athletes and making a difference. He was open minded and had an outstanding grasp not only in sports performance but other strength sports such as powerlifting, bodybuilding, and strongman. 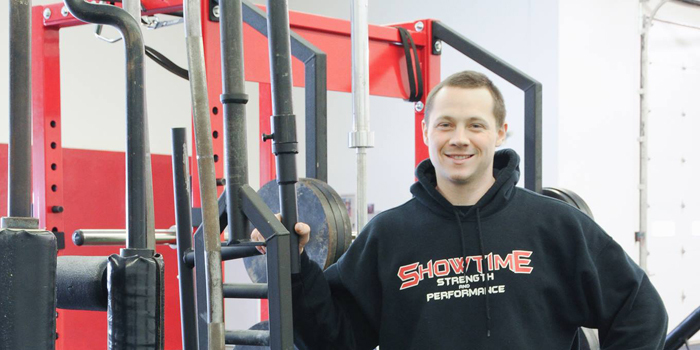 Before opening Showtime Strength and Performance, Nick has already acquired the Natural Ohio Bodybuilding Association (formerly known as the ONBF... funny story there). Showman has learned first-hand the unpleasantries of LLCs, real-estate, and the culture of youth athletics. Nonetheless, no matter which obstacle Nick has had to face, he has done so head-on. Knowing Nick personally and seeing first-hand the impact he has on the athletes and clients he works with, one thing is certain. Nick Showman will continue to be successful in coaching, business, and in life for one simple fact. He ensures it is ALWAYS about the success of the people he trains. Owning two business at 25 years old. How Nick got to wear he is now. What to look for with assessment tools. From landing to squatting. What are the most important movements fro all athletes in all sports. Listen to the podcast at EliteFTS.